With its sleek look and innovative features, this Bellera pull-down kitchen faucet combines an elegant, versatile design with exceptional ergonomics and functionality. The high-arch spout rotates 360 degrees and reaches over the tallest pots, while the compact, three-function sprayhead pulls down into the sink for up-close tasks, or out of the sink to fill pots. Sweep spray creates a wide, forceful blade of water for superior cleaning. Kohler's new docking system, DockNetik, secures the pull-down sprayhead to the spout using magnetic force. Three-function pull-down sprayhead with touch control allows you to switch from stream to Sweep spray to Boost Technology. With its contemporary curves and sleek, simple lines, the July faucet collection brings sophisticated European styling to your bathroom at an approachable price. The single lever handle offers easy, ergonomic control of both water volume and temperature. This faucet includes an escutcheon plate. Purist faucets and accessories combine simple, architectural forms with sensual design lines and careful detailing. Capturing the style of minimalist design, this tall bathroom sink faucet features a high spout, ideal for vessel sinks or sinks without faucet holes. The straight, ergonomic lever handle offers easy operation. Bellera 1 Or 3-Hole Single-Handle Pull-Down Sprayer Kitchen Faucet In Oil-Rubbed Bronze With its sleek look and innovative features, this Bellera pull-down kitchen faucet combines an elegant, versatile design with exceptional ergonomics and functionality. The high-arch spout rotates 360 degrees and reaches over the tallest pots, while the compact, three-function sprayhead pulls down into the sink for up-close tasks, or out of the sink to fill pots. Sweep spray creates a wide, forceful blade of water for superior cleaning. Kohler's new docking system, DockNetik, secures the pull-down sprayhead to the spout using magnetic force. 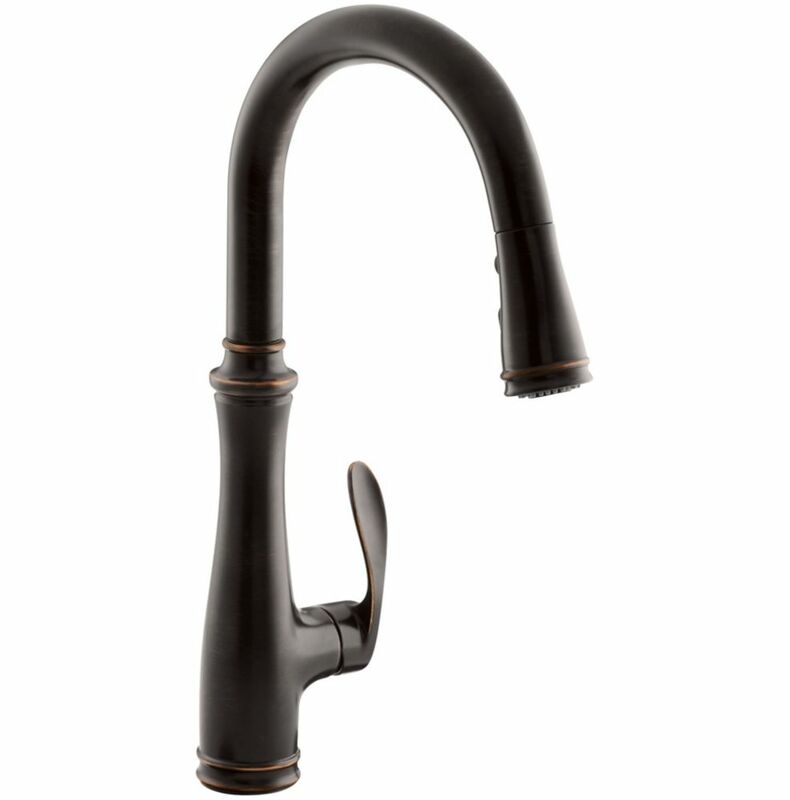 Bellera 1 Or 3-Hole Single-Handle Pull-Down Sprayer Kitchen Faucet In Oil-Rubbed Bronze is rated 4.6 out of 5 by 67. Rated 5 out of 5 by NewSink from Beautiful product. Works great and compliments our stainless steel appliances and sink. Beautiful product. Works great and compliments our stainless steel appliances and sink. Rated 5 out of 5 by Jana from Love it!!!! So much pressure and love that it turns.... Love it!!!! So much pressure and love that it turns. Rated 3 out of 5 by Tracy from Bought this faucet a few years ago and I love the features of the faucet. However, in the last m... Bought this faucet a few years ago and I love the features of the faucet. However, in the last month, the braided hose that is attached to the spray head has developed a leak. At first it was just a drip while the water was running but now when I pull the head down to use the sprayer the hose sprays water all over me. Pretty much useless now and makes a mess when washing dishes. Never had this happen with a faucet before. I would not recommend this product since it hasn't held up to normal use over only 3 1/2 years. Rated 3 out of 5 by JB from It arrived opened. Installed and hot water has no pressure. Think we may have received a faulty f... It arrived opened. Installed and hot water has no pressure. Think we may have received a faulty faucet. Rated 5 out of 5 by Steve from The faucet was very east to install. Only took 15 minutes. The water pressure is really strong an... The faucet was very east to install. Only took 15 minutes. The water pressure is really strong and the the design is good.